The major macroeconomic indicators. After a slow first quarter (again attributed to a severe winter), the economy picked up the pace and the most recent GDP estimate registered 3.9% growth. Employment has been increasing at 2.9 million jobs at an annual rate, or 2.1%, bringing the headline jobless rate down to 5.1% as of September. Low energy prices have driven the CPI down to 0.2%, year-over-year, and core inflation (excluding food and energy) is muted at 1.8%. The housing recovery is seeing existing home sales at 5.3 million unit pace (up 6.2% from a year ago), with prices 4.7% over a twelve-month span. Thus far in 2015, retail sales have been tracking job growth nicely, with a 2.1% increase annual increase as of August 2015. The major policy indicators. Federal Reserve policy remains pro-growth, as the September meeting held interest rates near the zero bound. Banking regulators are walking a delicate line between safety (seeking to avoid a repeat of the 2007 – 2009 financial crisis) and liquidity (using the low Fed borrowing rate to encourage banks to earn spreads by increasing loan activity). Real estate has been able to access debt funding across a range of lenders. Fiscal policy remains captive to Congressional gridlock, though. Exporters are being hobbled by the de-funding of the Export-Import Bank, and badly needed infrastructure work is stalled as the Transportation Bill has been bottled up. As far as progress is concerned, Washington continues to try to row with one oar out of the water. The Outlook. 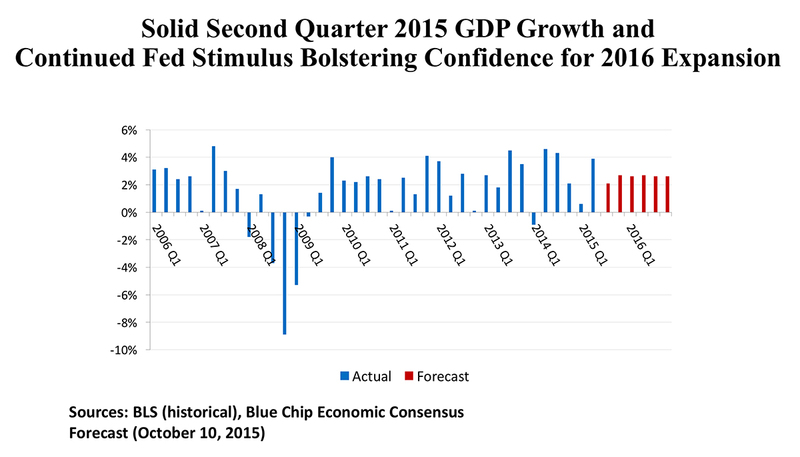 The Blue Chip Consensus forecast is calling for 2.7% GDP growth in 2016, accompanied by tighter labor markets (a 4.7 unemployment rate by the end of next year), and modestly higher inflation (a CPI increast of 2.7%). Interest rates will still be very low by historical standards, with a 1.4% 3-month Treasury rate, and 3.2% for the yield on the 10-year Treasury. Personal income is forecast to rise by 2.6%, and with increased consumer confidence, personal expenditures are predicted to advance by 2.9%. Housing starts are expected to rise to 1.3 million homes, as a solid economy supports a further residential rebound. Employment Trends. 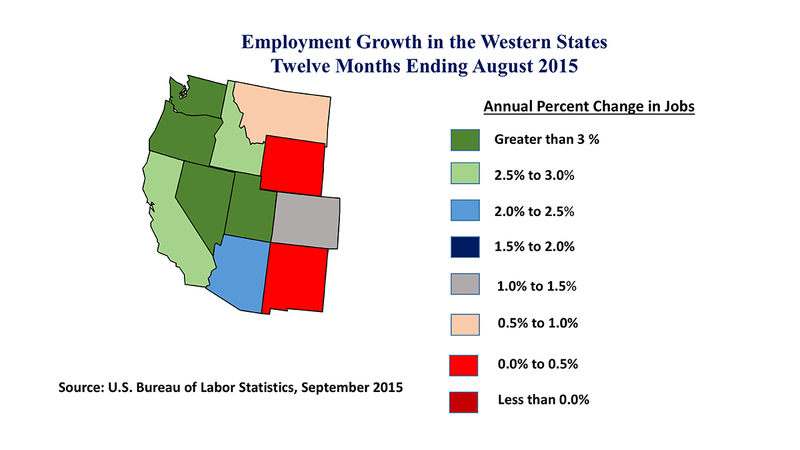 All states in the Western region posted job gains in the twelve months ending August 2015. The advances ranged from a marginal improvement of just 400 jobs (0.1%) in Wyoming to a 407,000 increase (3.0%) in California. On a percentage basis, though, four states outpaced California, with Utah leading the way at 4.0%, followed by Oregon (3.4%), Nevada, (3.3%), and Washington (3.2%). States with significant improvements distributed the new jobs across several industry sectors, including professional and business services (a source of office user demand) and trade/transportation (affecting the industrial sector). The slower-performing states were in the Rocky Mountain area, and the sharp decline in the energy sectors doubtless contributed to their weaker recent growth. Connected to Global Economy. There were both positives and negatives in the extensive linkages of the Western U.S. economy with the worldwide economy. The strengthening of the U.S. dollar has lowered input-costs for imported materials, and had a generally positive effect in limiting inflation. This, in turn, has kept financing costs low, a stimulative influence on economic growth. Key manufacturing industries have enjoyed some modest expansion in this environment; those industries include semiconductors, biotech, pharmaceuticals, and both commercial and military aircraft production. And as cyber-threats continue to plague private industry and government alike, demand for security products in the “big data” field are bolstering tech businesses in many Western locations. Coping with Mother Nature. The long drought that has afflicted the area west of the 100th meridian of longitude (just east of the Colorado/Kansas border) has impacted current economic conditions and growth prospects in this region. California’s economy is taking a $2.7 billion hit, largely in its agricultural sector. Las Vegas has just completed an $817 water tunnel with an intake near the bottom of Lake Mead, to assure its water supply as the vast reservoir behind Hoover Dam finds itself at only 38% of capacity, with the lake’s surface 147 feet below its high-water mark. A longer, more intense wildfire season in the West has raised economic costs into the billions, when fire suppression expenses, insurable losses, and land re-generation programs are accounted for. Many have been attracted to the West by its remarkable natural beauty. We may be approaching the limits of the region’s capacity to accommodate substantial further population increase by previous patterns of development. Offices. The tech-intensive Bay Area has attracted the largest volume of office building investment thus far in 2015, with over $5 billion in such purchases in the San Jose metro alone, and $4.9 billion in San Francisco. Southern California has also seen fervid activity, with $4.5 billion in Los Angeles office acquisitions, $2.3 billion in Orange County, and $2.2 billion in San Diego. Average cap rates in these metros have ranged between 5.2% and 6.0%. The Pacific Northwest has also proved a magnet for investment, with Seattle posting $4.2 billion in office deals, and the smaller Portland metro tallying $1.1 billion in sales. Further from the coast, Denver and Phoenix have each accounted for approximately $1.8 billion in office transactions, albeit at somewhat higher average cap rates in the 6.7% - 7.0% range. According to Real Capital Analytics, international investors have been especially focused on San Francisco and Portland. REITs, meanwhile, have been the buyers in almost 40% of the San Jose/Silicon Valley deals. Institutional investors and private equity funds have significant shares in the Southern California markets, as well as in Denver and Phoenix. In the West, as elsewhere, investors are broadening their sights, particularly in light of the extremely high prices in the major CBDs. This means increasing activity in select suburban markets, as well as greater volume in so-called secondary and tertiary markets. Industrials. Investors seeking to capitalize on the Pacific coast’s already robust trade flows, and perhaps eying the potential passage of the Trans-Pacific Partnership trade agreement, have committed more than $17.5 billion in more than 1,500 industrial property acquisitions in the Western states thus far in 2015. Port cities like Los Angeles ($3.5 billion), Seattle ($1.6 billion), and San Francisco’s East Bay market ($1.3 billion) have been particularly attractive. But upland markets, such as Southern California’s Inland Empire ($1.8 billion) and tech-dominant San Jose ($1.2 billion) have also enjoyed a vibrant market in industrial property transactions. Cross-border investors have been a powerful force behind these capital flows. In Seattle, these international purchasers accounted for a 51% market share in the industrial space. For the East Bay, the figure was 47%; Portland (43%), Orange County (42%), and Inland Empire (39%) were not far behind. In all those markets, cross-border buyers led all investor groups. On a nationwide basis, there are perhaps two significant trends to note. 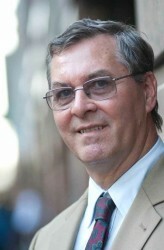 First, European capital sources are joining Asian investors as major players. And, secondly, the cross-border purchasers are frequently coming in as partial-interest investors or as members of an acquisition joint-venture. Retail. A mix of malls, neighborhood shopping centers, and stand-alone supermarket or drugstore properties combined for just above $18.4 billion in retail property investment in the West year-to-date. Los Angeles had by far the greatest intensity of activity, with 242 deals accounting for $3.1 billion in aggregate purchase price. The resurgence of urban retailing – and of L.A.’s downtown – can be epitomized by the $24 million deal ($358 per sq. ft.) for the 11th and Main St. retail complex. At a larger scale, Clarion Partners purchased the McGrath Court Shopping Center in San Diego for just under $107 million. In addition to L.A., only Phoenix ($1.3 billion) and Seattle ($1.2 billion) have registered more than a billion dollars in retail property deals this year. In fact, “tertiary” markets in the region accounted for more than $5.6 billion in shopping property transactions – a clear indication of how diffuse retail real estate can be. Private equity has been the primary source of acquisition capital for retail assets in the West, taking a 44% share of the deal flow. REITs are next, with a 20% slice of the pie. Thus far in 2015 major portfolio transactions have not been concluded, a market segment that often bolsters the investment totals. 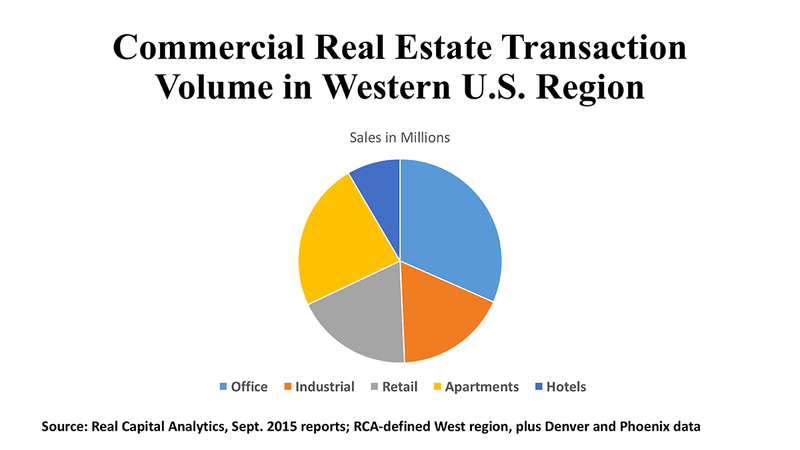 With over 1,200 retail deals transacted in the West year-to-date, it is evident that there is good liquidity for shopping centers and other store-based properties.